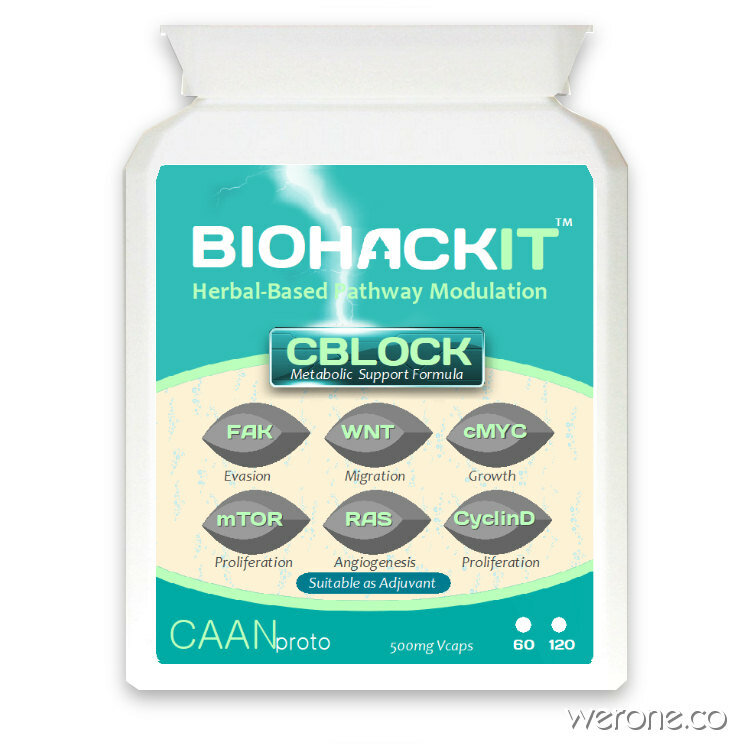 BiohackIT CBLOCK™ is a broad-based nutraceutical formula containing herbal extracts and other nutrients which have been shown to repair and prevent mutagenic cellular damage. Mutagenic cell behaviour usually follows oxidation with damaged or deleted tumor surpressors which enable tumors to grow without challenge. destruction or detection by the immune system. CBLOCK™ is best supported with TXFACTOR™, VBLOCK™, B Complex (or NUTRIB™), MelMagic™, OmegaDHA™, Bovine Colostrum a Ketogenic Diet with regular cruciferous vegetables. For extra homonal support against estrogenic drivers include DIMMagic™. Hormone therapies slow or stop the growth of hormone-sensitive tumors, which require certain hormones to grow. Hormone therapies act by preventing the body from producing the hormones or by interfering with the action of the hormones, one such molecule is Diindolylmethane (DIM) and is included in CBLOCK™. DIM was also found to induce cell cycle arrest, helping slow replication of cancer cells. It also helps modulate key CYP enzymes in the liver, aiding important detoxification channels. DIM was found to alter angiogenesis, the lay-down of new vessels that tumors rely on for continued growth. It decreases cell invasion, metastasis and epigenetic behavior of cancer cells as well. Diindolylmethane was found to induce Nrf2-mediated, intercellular detoxification (GSTm2, UGT1A1, and NQO1) and antioxidant (HO-1 and SOD1) genes. These pathways are our essential detoxification pathways inside every cell. Think of them as the cellular garbage service that gets rid of the poisons that would otherwise wreak havoc. Individuals with genetic defects on Nrf2, Glutathione, and SOD genes have an even greater need to support such cellular garbage service. Signal transduction inhibitors block the activities of molecules that participate in signal transduction, the process by which a cell responds to signals from its environment. During this process, once a cell has received a specific signal, the signal is relayed within the cell through a series of biochemical reactions that ultimately produce the appropriate response(s). In some mutagenic cells, the malignant cells are stimulated to divide continuously without being prompted to do so by external growth factors. Signal transduction inhibitors interfere with this inappropriate signaling. Gene expression modulators modify the function of proteins that play a role in controlling gene expression. Apoptosis inducers cause tumor cells to undergo a process of controlled cell death called apoptosis. Apoptosis is one method the body uses to get rid of unneeded or abnormal cells, but tumor cells have strategies to avoid apoptosis. Apoptosis inducers can get around these strategies to cause the death of tumor cells. Angiogenesis inhibitors block the growth of new blood vessels to tumors (a process called tumor angiogenesis). Tumor cells take up and metabolise glucose and glutamine to a degree that far exceeds their needs for these molecules in anabolic macromolecular synthesis. Commonly occurring oncogenic signal transduction pathways initiated by receptor tyrosine kinases or Ras engaged PI3K-Akt signaling to directly stimulate glycolytic metabolism. Oncogenic levels of Myc have recently been linked to increased glutaminolysis through a coordinated transcriptional program. Myc-activation/amplification is one of the most common oncogenic events observed in mutagenic cells. CBLOCK™ is a broad-based organic nutraceutical formula containing herbal extracts and other nutrients which have been shown in previous studies restore some of these Tumor supressors, provide immune system support, reduce inflammation and block glutamine pathways which are used a supplementary food supplies for tumor cells. CBLOCK™ attempts to block the pathways which are used for replication and proliferation of tumor cells. CBLOCK™ has not been proven in this respect though it’s individual ingredients have been shown in various studies to be efficacious and safe. CBLOCK+™ is best supported with TXFACTOR™, VBLOCK™, B Complex(or NUTRIB™), MelMagic™, OmegaDHA™, Zinc & Selenium, Bovine Colostrum and a Ketogenic Diet with regular cruciferous vegetables. For diet resources see BiohackIT app. Suggested Use: Take 3-4 capsules with water four times per day prior to food or as directed by your healthcare professional.